The best day in a long time! Wow, today was one of those red letter days, you just have to expound on it because everything seamlessly fell into place unlike my day a week ago, when nearly everything fell apart at once. To start my day, I learned that I won a children’s sewing book after entering a contest on a sewing blog–a big thanks to my daughter Kelly, for sending me to the blog and encouraging me to enter the contest. I can’t wait to try out the patterns on my lovely grandkids! Then I interviewed Fr. Gary Thomas, the priest whose story is chronicled in the new movie ‘The Rite.’ He was very easy going and amiable, the interview went off without a hitch and miracle of miracles, I wrote the story in one hour–rocking my deadline! Next, the UPS delivery guy dropped off two boxes: the first from Amazon that contained two books–a gift from a new friend, who has quickly become a kindred spirit and a true blessing in my life. Our friendship happened after a very horrible ebay selling experience and I do believe God sent me her as my angel. Thank you Sheila–I will never forget your kindness. The other box contained four extra sets of bottles and soda mix for our Sodastream soda maker. The thing is, I received the same order yesterday. So, I called the company and spoke with a lovely lady named Kristin who informed me that it was a gift for having to wait so long for my order–and this was on top of getting some extra soda points in my account! Wow, talk about fantastic customer service. Not only do they make a great product but they went above and beyond normal customer support–thank you Sodastream! We are forever customers! 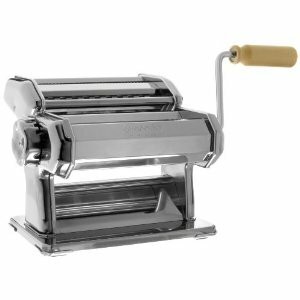 Lastly, I finally got the courage to use my new Imperia hand crank pasta machine and made a batch of gluten-free fettuccine. I think I died and went to heaven–that pasta was so tasty, so succulent, and so much better than store bought gluten free noodles and much cheaper! I think I probably gained 10 glorious pounds–sorry Doc, I will be better tomorrow! That is unless I find another recipe to try!